3 yellow trimmer combs: #½ (1.5 mm), #1 (3 mm) and #1½ (4.5 mm). The combs are designed to fit the t-shaped adjustable blade supplied with the Wahl Hero. Can also be used with the Wahl Detailer if fitted with that blade. £6.59 (inc. VAT) Why no VAT? We're a trade wholesaler and quote our prices without VAT to help our VAT-registered customers understand the true cost of a purchase. UK voltage replacement transformer and power lead designed for the Wahl AC Detailer or Wahl Hero trimmers or the Wahl Super Micro or Wahl Peanut clippers. Now with plug attachment included! 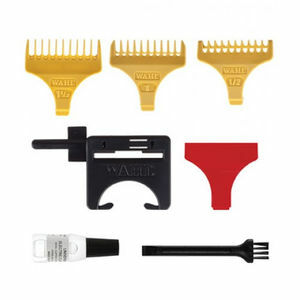 Corrosion-resistant, T-shaped blade that can be adjusted to zero overlap for the Wahl Hero, 8900 and Detailer trimmers.